"HAPPINESS. One word, nine letters, roughly seven billion definitions, one for each person on the planet. Share in the planet's lessons on youth, old age, love, death, work and family. 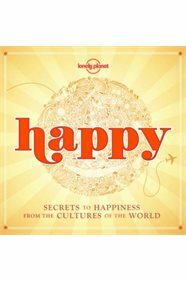 This Lonely Planet title features fascinating insights into how happiness is created in different cultures, and how we can be happy too. Each lesson is uniquely illustrated and is designed to inspire. Bring a little slice of happiness to your life now with this new mini edition!"